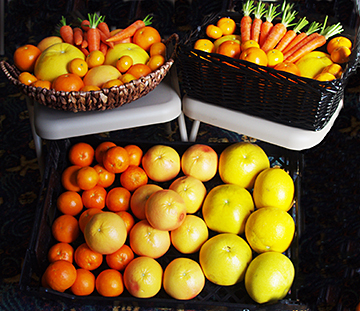 All the wonderful fruit and vegetables were provided by the Master Gardeners. Speakers and Master Gardeners Jim Hillis and Ray Michalik, stand with door prize basket winners Suzanne Goodson, John McLure and Mike Murphy. 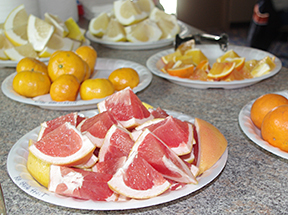 Everyone sampled the delicious fruit. 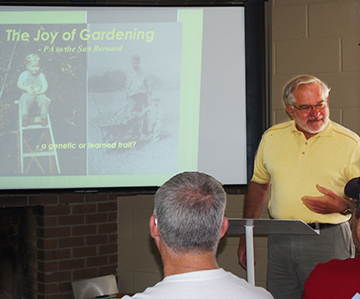 Jim Hillis describes “The Joy of Gardening” in his slide presentation about gardening on the river. Master Gardener Jim Hillis discussed his successes and failures of gardening on the banks of the San Bernard over the past ten years during the first of a series of six educational programs, sponsored by the FOR Environmental Committee, on Saturday, Feb 14th. Forty interested people attended the program held at the FOR Community Center. Jim suggested two important items to consider for a successful garden along the river. The first is to add gypsum to your soil. Because of the high salt content in well water around the San Bernard, adding gypsum, such as Sof’n-Soil, to your garden will help eliminate salts collected from watering. It also improves the gumbo by loosening compaction that improves drainage. And drainage was the second important item to consider. Improving soil drainage, can improve the overall health of your lawn and garden. A way to avoid your plant roots from standing in water is to plant them in raised beds. Master Gardener Ray Michalik discussed the art and science of growing various fruit and citrus trees suitable for this area. Drainage is also an important factor with trees. Most fruit trees will not survive in soil that drains slowly. Temperature is also important since some varieties are cold-hardy and others are semi-tropical. A fruit variety’s chilling requirement is a key to how it will consistently produce satisfactory crops of fruit. 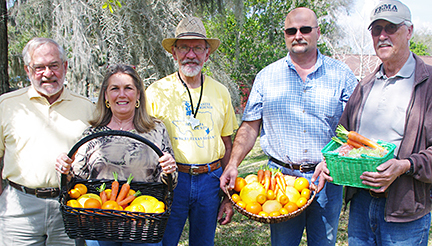 Buy a plant or tree suitable for growing in this area at the Brazoria County Master Gardener 9th Annual Fruit & Citrus Tree Sale, Feb 21, 8:00 a.m. - 12:00 noon at the Brazoria County Fair Grounds in Angleton. Two $35 gift certificates, good for purchasing plants or trees at the sale, were awarded as door prizes at the gardening program by the FOR Environmental Committee. Below are links that answer just about every question you have about growing healthy plants.